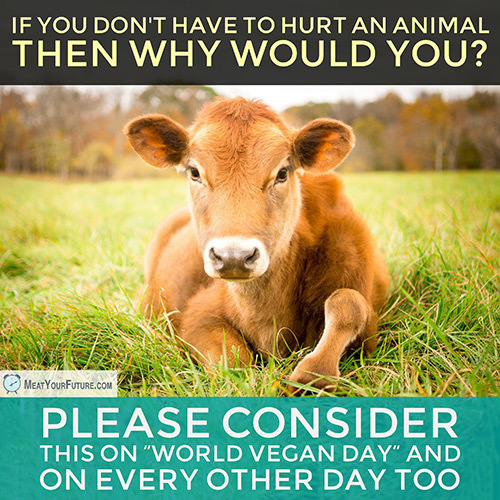 We’d like to say “happy” World Vegan Day today. But, the reality is that our world is still far from happy. Our consumption of animal products continues to relentlessly inflict unnecessary death and suffering upon countless billions of helpless animals, while devastating our environment as well. Humanity has the power to end this injustice at any time, simply by not eating or using animals. So, if you believe that it’s wrong to harm animals unnecessarily, please go vegan and help put an end to this needless and destructive violence. Going vegan is one of the easiest and most positive impactful actions you can take (including for your own health and for the planet). But, in the end, it’s the very least we owe to other animals.